Ski jumpers compete in one of the wildest sports in the Winter Olympics. When ski jumpers launch into the air, they sometimes travel over 360 feet, or the length of about nine school buses or 3.5 blue whales. We compared their jumps to other large objects to give a sense of just how far they go. Ski jumping is one of the most spectacular sports of the Winter Olympics. Athletes fly down a hill at about 60 miles per hour, then launch into the air, traveling over 300 feet while about 10-15 feet off the ground. To give a better sense of just how far these ski jumpers go, we compared the distances of the men and women's gold-medal jumps on the normal hill at the Pyeongchang Olympics. Maren Lundby of Norway jumped 360.89 feet, while Andreas Wellinger of Germany jumped over 372 feet on his biggest jump. Just how far is that? Both of them cleared nine school buses. 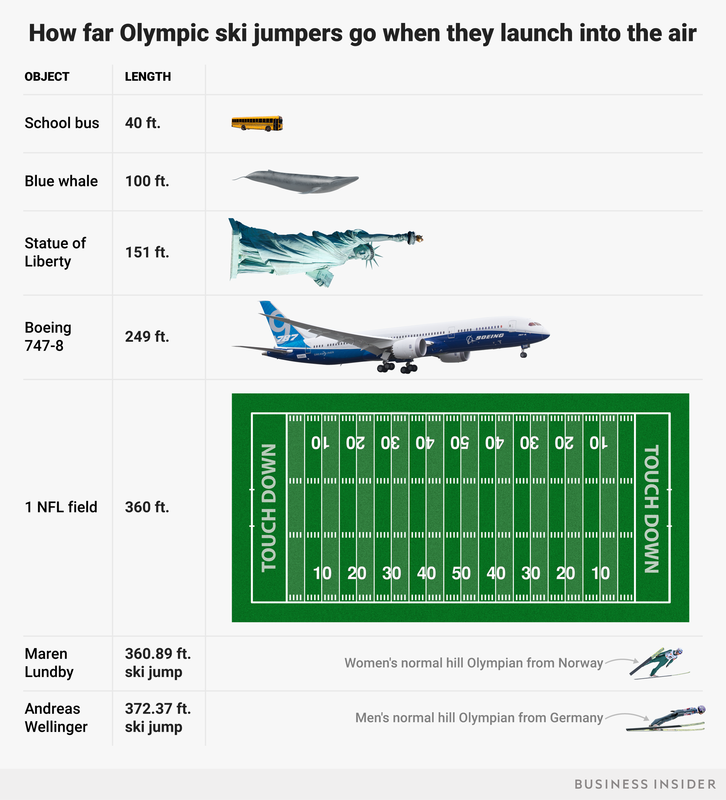 Here's a look at how their jumps compared to other large objects.